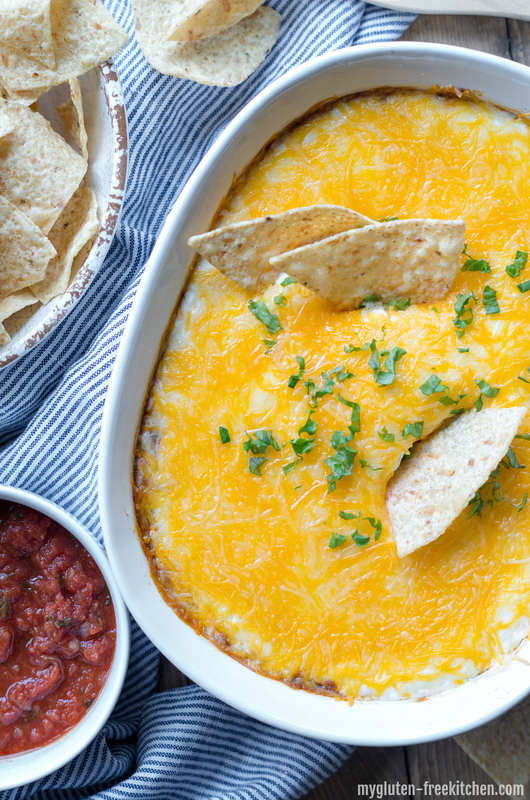 Creamy, cheesy bean dip is a favorite gluten-free appetizer. 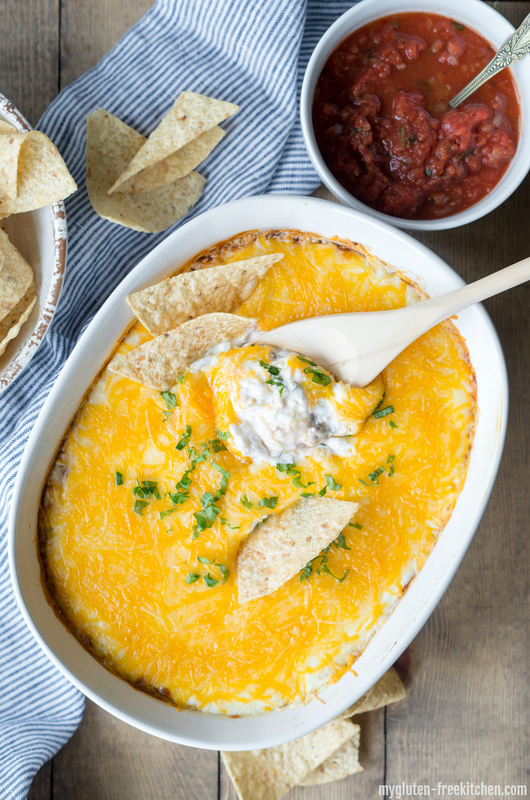 We have this gluten-free cheesy bean dip for dinner often too as it makes a great burrito filling! One of my favorite things about fall and winter is football season. Since moving to Boise, we catch every Boise State game in person or on TV. We also watch many NFL games every weekend as we are both big fans. We love inviting friends over to take in the game and enjoy a bunch of food. 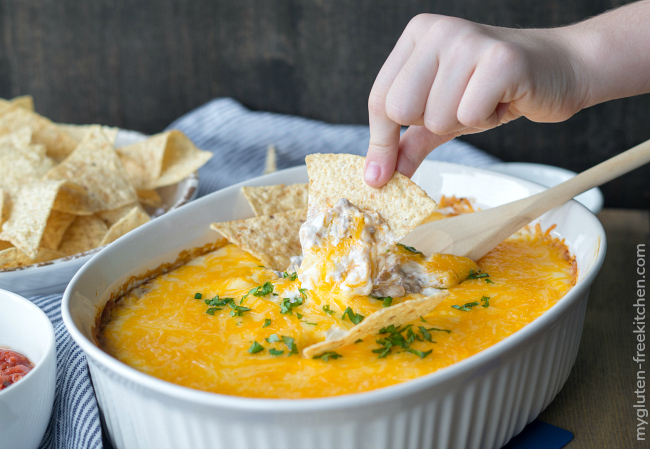 Any good football game is made better with a good selection of gluten-free finger foods and dips. Some people stop entertaining in their home once they go gluten-free. Some think that it will either cost them a ton to feed everyone gluten-free, or that they have to allow gluten in their home in order to feed everyone, thus increasing their risks of cross-contamination. Hosting a football party doesn’t have to be expensive or full of gluten. Today I’m sharing a yummy spread of foods that are sure to please gluten eaters and gluten-free folks alike, all without breaking the bank! You can easily invite others to contribute some of these items when they come to your house as well. People usually like to bring something, and welcome a specific suggestion, plus it helps reduce your costs a bit. I like to have a variety of healthy, semi-healthy, and definitely splurge items at our football parties. Fresh fruit – sliced apples, grapes, pears, oranges, etc. Fresh veggies – baby carrots, celery sticks, broccoli, cauliflower, etc. Make a big bowl of air-popped popcorn with butter & salt – we do this a lot! You can find more ideas on my Gluten-free Appetizers board on Pinterest! The meat is totally optional and adjustable, meaning leave it out, double the amount, sub ground turkey instead, anything. I don’t recommend you use light sour cream in it, it always curdles. Use a good, natural, full-fat sour cream for best results. I always use Daisy sour cream as it doesn’t have a bunch of extra stuff added like many of the sour creams out there. I like to use refried black beans but you can use any refried beans. Use your favorite taco sauce that you know is gluten-free. I prefer mild sauce, and go with Taco Bell Mild Restaurant Sauce for mine. Bonus: it’s only 99 cents at my local store! You can use any ceramic or glass baking dish for this. I always use my trusty CorningWare 2-1/2-Quart Oval Casserole Dish with Glass Lid . I’ve had this casserole dish since we got married 14 years ago and love that it is sturdy, the perfect size, and easy to clean. I hope you can make this soon for your next football party! Leave a comment if you want to share with me your favorite football party food. 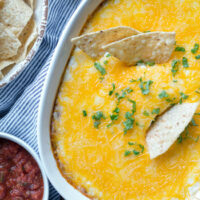 This is a great cheesy bean dip served with tortilla chips, but is also perfect as a burrito filling. You can make this bean dip meatless or extra meaty, depending on your preference! In a skillet, cook the ground beef, sprinkled with the taco seasoning, until cooked. In an ungreased 2-qt. casserole dish, stir together the ground beef and refried beans. Sprinkle the cheese over the top of all. Bake at 350, covered for 20 minutes. Remove cover and bake for 15-20 minutes longer, or until bubbly and cheese has browned a bit. I don't recommend you use light sour cream in it, it always curdles. Use a good, natural, full-fat sour cream for best results. I always use Daisy sour cream as it doesn't have a bunch of extra stuff added like many of the sour creams out there. I hope you and your guests enjoy this! When I was first diagnosed with Celiac D. It was so hard to find good things to cook. Since I’ve found My gluten free kitchen it’s been AWESOME! I love to cook so it’s so nice to have this! !